Background The rupture of an abdominal aortic aneurysm is a highly lethal event, claiming approximately 15,000 lives each year. Traditionally, open surgical repair has been the mainstay for treatment. However, this surgery is associated with almost a 50% perioperative mortality rate. Minimally invasive endovascular stent grafts have been used with great success in the elective repair of aortic aneurysms. This technology has subsequently been applied to the repair of ruptured abdominal aortic aneurysms with a substantial reduction in the periprocedural death rate and associated complications. Case Report We report a case of a patient with a ruptured abdominal aortic aneurysm and an acute ST elevation myocardial infarction who was treated with an endovascular stent graft in a totally percutaneous fashion using only conscious sedation and local anesthesia. Conclusion Although the risk of mortality and complications remains high, endovascular repair of a ruptured abdominal aortic aneurysm offers the patient the best chance of survival. We report the first case in our institution of a patient who presented with an rAAA and an evolving ST elevation myocardial infarction, treated in a totally percutaneous fashion using local anesthesia and conscious sedation. A 62-year-old male, without significant medical history, presented to the emergency room of an affiliated hospital complaining of acute-onset, severe lower abdominal pain radiating down his left leg, as well as weakness and dizziness. He had a presyncopal episode en route to the hospital but denied any chest pain or shortness of breath. During his initial assessment, an electrocardiogram showed ST-segment elevation in leads 2, 3, and aVF, indicating an acute inferior-wall myocardial infarction. The patient received 325 mg aspirin from the paramedics and 600 mg of clopidogrel in the emergency room to treat his acute coronary syndrome. Clinically, he remained stable but continued to complain of abdominal and low back pain. 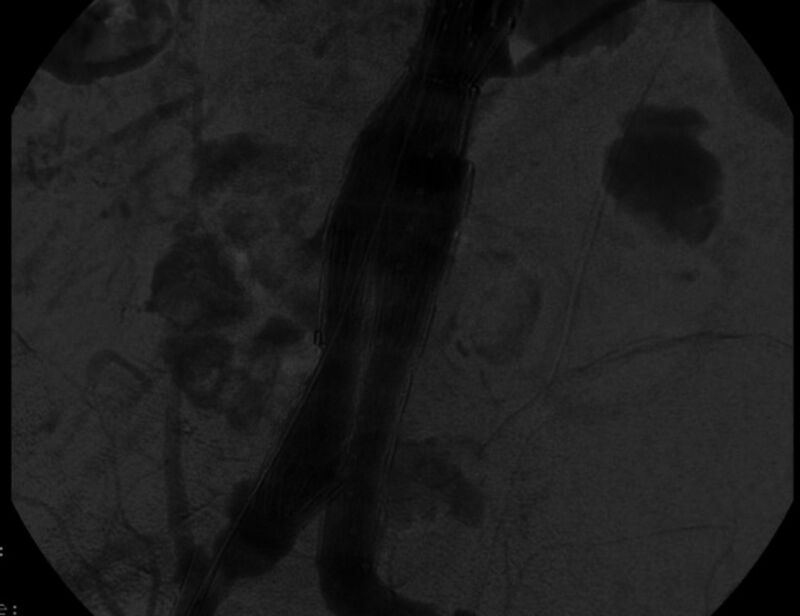 A computed tomography angiogram of the abdomen and pelvis revealed a ruptured 6.6-cm infrarenal AAA with a large left-sided retroperitoneal hematoma (Figure 1). 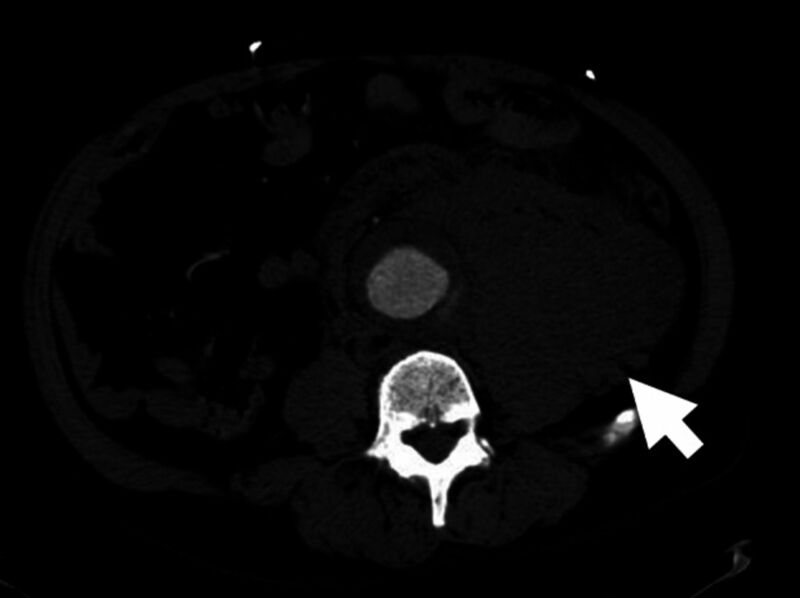 Abdominal computed tomography scan showing a ruptured infrarenal aortic aneurysm with a large left retroperitoneal hematoma (arrow). To be a candidate for EVAR, certain anatomic criteria related to the aneurysm morphology must be met, including a requirement that a segment of nonaneurysmal infrarenal aorta with a diameter of 18-32 mm and common or external iliac artery diameter of 8-25 mm be present. Both of these measurements must extend for a length of 10-15 mm to allow for the apposition of the stent graft to the arterial wall, excluding flow to the aneurysm sac. The anatomy of the patient's aneurysm appeared amenable for endovascular stent graft repair (Figure 2). He was emergently transferred to our main facility and prepared for EVAR. Of note, the patient had an accessory left renal artery originating well below the main renal vessels. However, he had sufficient normal aorta below the left renal artery to preserve flow to the artery while not compromising the seal zone required for adequate fixation of the endovascular graft. 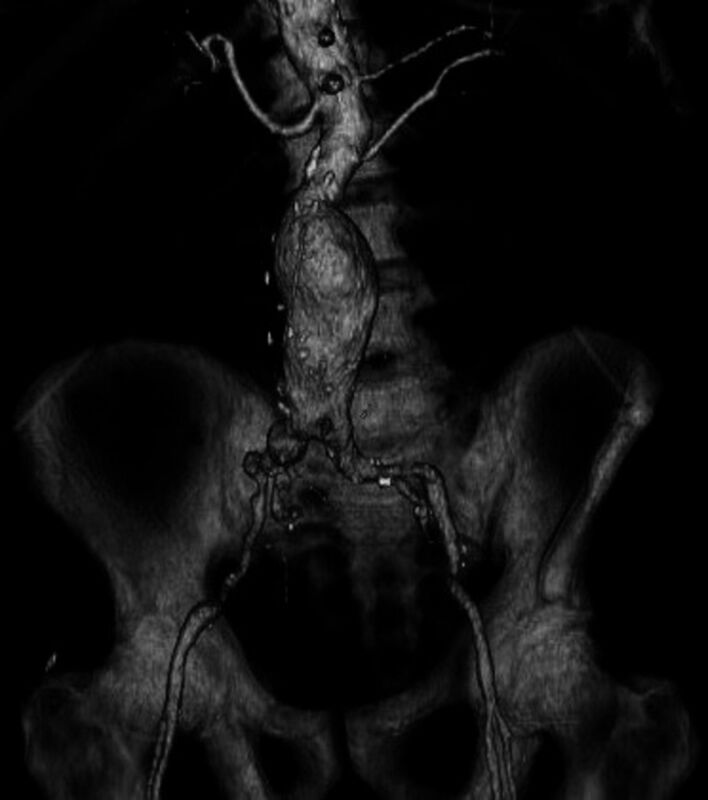 Three-dimensional reconstruction of an abdominal computed tomography scan showing the appropriate anatomy for endovascular aneurysm repair. Note the accessory left renal artery originating well below the main renal arteries. On arrival, the patient was awake and alert, complaining only of lower abdominal and back pain. His vital signs on arrival included heart rate of 133 beats/min, blood pressure of 108/68 mmHg, and respiratory rate of 22 breaths/min. Physical examination showed a tender abdomen with a palpable, pulsatile mass and normal femoral and pedal pulses. Informed consent was obtained from the patient and his family, and he was moved to our hybrid, endovascular operating room for repair of his rAAA. The anesthesiology team placed both arterial and central venous catheters. The patient's abdomen and groins were prepped and draped in standard fashion. The bilateral common femoral arteries were anesthetized with 1% lidocaine and accessed under direct, ultrasound-guided visualization, and the arterial sheaths were placed. The patient was lightly sedated using dexmedetomidine throughout the procedure but was alert enough to follow commands and hold his breath during digital subtraction angiography. Two Preclose ProGlide (Abbott Laboratories, Abbott Park, IL) suture-mediated vascular closure devices were placed in a preclosed fashion in each common femoral artery prior to placement of a 20-French and a 16-French sheath in the right and left common femoral arteries, respectively. Repair of the rAAA was then performed using a Cook Zenith (Cook Medical Inc., Bloomington, IN) modular, bifurcated endovascular graft (Figure 3). Once the repair was complete, the wires and sheaths were removed and the heparin anticoagulation was reversed with protamine. The preplaced arterial sutures were secured and pressure was held over each common femoral artery to ensure hemostasis. Completion angiogram after endovascular aneurysm repair. During the repair, the patient remained hemodynamically stable. Total operative time, including the pressure held over the arterial access sites, was 152 minutes. The estimated operative blood loss was 100 mL. The following day, the patient was ambulating, tolerating a regular diet, and experiencing no abdominal or chest pain. His troponin I level peaked at 28.6 ng/mL on the first postprocedure day, and a coronary angiogram revealed 3-vessel disease. He was discharged home on the fourth postprocedure day in good condition with plans for outpatient management of his coronary disease. When seen in the vascular surgery clinic 2 weeks after his repair, he appeared to be doing well with no complaints. The arterial access sites in each groin had healed with no evidence of hematoma or pseudoaneurysm. A duplex ultrasound of his aortic stent graft showed a thrombosed aneurysm sac with no evidence of endoleak. Multiple, randomized trials have shown EVAR for elective repair of AAA to have a significantly lower 30-day mortality rate compared to conventional open surgical repair.6,10 This advantage is likely attributed to the reduced physiologic and cardiovascular stress that occurs with major vascular operations. The mortality difference between EVAR and conventional open repair for rAAA is even more dramatic. The largest series to date comparing EVAR to open repair of rAAA included 1,037 patients from 49 centers worldwide. The analysis showed the overall 30-day mortality to be 21.2% after EVAR compared to 36.3% after open repair (P<0.0001).11 Other reviews of single-center and multicenter observational data, as well as nationwide population studies, have reported similar results, with perioperative mortality rates of 41%-48%8,12 following open surgical repair compared to 18%-29%3,13 after EVAR. The improved survival following EVAR for rAAA is likely due to a reduction in overall cardiovascular stress associated with aortic cross-clamping, potentially massive blood loss, and the large fluid shifts and resuscitation that can occur with major intraabdominal surgery. Traditionally, EVAR is performed using general anesthesia and open common femoral artery exposure to allow for safe access and subsequent repair of the arteriotomy. Percutaneous EVAR has been described with off-label usage of suture-mediated arterial closure devices and has been shown to be safe and effective.14 The proposed benefits of percutaneous EVAR include shorter operative times, fewer groin wound complications, reduced postoperative pain, and a faster return to normal activities. The biggest drawback to this technique is the added cost of the closure devices; these products may not be fully reimbursed and could add up to $1,000 to an already expensive procedure. For our patient, the decision to perform a percutaneous EVAR allowed us to avoid general anesthesia, which was particularly favorable because he had an active myocardial infarction. The added stress of general anesthesia could have worsened his myocardial infarction and could have significantly increased his operative mortality. The use of conscious sedation and local anesthesia essentially eliminates the cardiovascular depressive effects associated with general anesthesia that can lead to sudden hemodynamic collapse. In fact, the surgical dictum for a patient with an rAAA who is undergoing an open repair is to prep and drape the patient awake so the surgical team is ready should the patient decompensate upon the induction of anesthesia. Endovascular repair of an rAAA offers the patient the best chance of survival. While the risk of mortality and periprocedural complications remains high, minimizing the physiologic stress of the operation improves patient outcomes. Totally percutaneous EVAR is a well-described technique that, when combined with conscious sedation, further reduces operative stress by avoiding general anesthesia. In the elective setting, percutaneous EVAR can be used to treat patients with severe cardiac or pulmonary disease for whom general anesthesia may be a prohibitive risk. (11, 1991) Transfemoral intraluminal graft implantation for abdominal aortic aneurysms. Ann Vasc Surg 5(6):491–499, pmid:1837729. (10, 1995) Initial experience with transluminally placed endovascular grafts for the treatment of complex vascular lesions. Ann Surg 222(4):449–465, pmid:7574926, discussion 465-469. (6, 2008) Expanding use of emergency endovascular repair for ruptured abdominal aortic aneurysms: disparities in outcomes from a nationwide perspective. J Vasc Surg 47(6):1165–1170, pmid:18394857, discussion 1170-1171. Epub 2008 Apr 3. (6, 2007) Canadian Society for Vascular Surgery. Screening for abdominal aortic aneurysm in Canada: review and position statement of the Canadian Society for Vascular Surgery. J Vasc Surg 45(6):1268–1276, pmid:17543696. (6, 2010) Paradigm shifts in the treatment of abdominal aortic aneurysm: trends in 721 patients between 1996 and 2008. J Vasc Surg 51(6):1348–1352, pmid:20488317, discussion 1352-1353. (10 14, 2009) Open Versus Endovascular Repair (OVER) Veterans Affairs Cooperative Study Group. Outcomes following endovascular vs open repair of abdominal aortic aneurysm: a randomized trial. JAMA 302(14):1535–1542, pmid:19826022. (7, 1993) Ruptured abdominal aortic aneurysm: a population-based study. J Vasc Surg 18(1):74–80, pmid:8326662. (6, 2002) A meta-analysis of 50 years of ruptured abdominal aortic aneurysm repair. Br J Surg 89(6):714–730, pmid:12027981. (1, 2008) Endovascular repair of ruptured abdominal aortic aneurysms: a systematic review and meta-analysis. J Vasc Surg 47(1):214–221, pmid:18178478. (9 4-10, 2004) EVAR trial participants. Comparison of endovascular aneurysm repair with open repair in patients with abdominal aortic aneurysm (EVAR trial 1), 30-day operative mortality results: randomised controlled trial. Lancet 364(9437):843–848, pmid:15351191. (11, 2009) RAAA Investigators. Collected world and single center experience with endovascular treatment of ruptured abdominal aortic aneurysms. Ann Surg 250(5):818–824, pmid:19809296. (10, 2007) Ruptured abdominal aortic aneurysms: endovascular repair versus open surgery—systematic review. Radiology 245(1):122–129, pmid:17885185. (1, 2010) Management of ruptured abdominal aortic aneurysm in the endovascular era. J Vasc Surg 51(1):9–17, pmid:19883986, discussion 17-18. Epub 2009 Nov 1. Erratum in: J Vasc Surg. 2010 Apr;51(4):1079. (6, 2007) Total percutaneous access for endovascular aortic aneurysm repair ("Preclose” technique). J Vasc Surg 45(6):1095–1101, pmid:17398056, Epub 2007 Mar 29.